Kerala Easy Fried Rice is a nutritious combo of a variety of veggies blended with white rice and usually served with an accompaniment like raitha or curd. 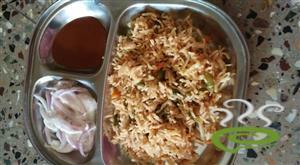 Kerala Easy Fried Rice is an easy to prepare dish and is a whole meal in itself. Kerala Easy Fried Rice is unique and tasty with cooked rice blended and sautéed with a delicious array of nutritious veggies. 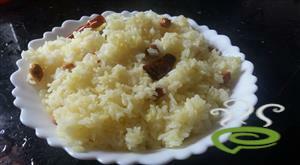 Kerala Easy Fried Rice, as the name denotes, is the easiest of dishes that can be prepared in a jiffy. You can explore a well detailed Kerala Easy Fried Rice here. For prepaaring Kerala Easy Fried Rice, first heat 4 tbsp of butter in a pan. Add the well cleaned rice and fry it. Add 4 cups of water along with salt and cook it well. Heat 2 tsp of butter in another pan. Add chopped onions and stir it. 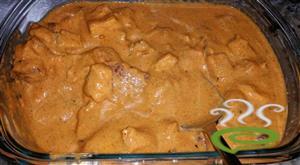 When it becomes brown, mix the ginger and garlic paste and stir, till it`s aroma emits. Add chopped carrots, beans and cabbage. 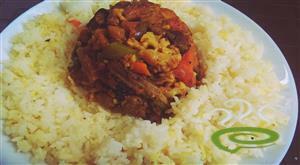 :- Vegetables should be half cooked. Mix cooked rice and stir it well on a low flame. Mix well with soya sauce and chilly sauce. Garnish with fried onions, cashew nuts and raisins. 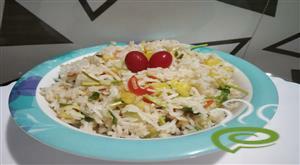 :- Serve Kerala Easy Fried Rice hot. 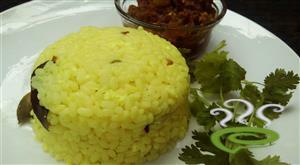 :- Boneless cooked and minced meat(100 gm) and two scrambled eggs can make the dish non-vegetarian. Fried rice came out very well. My husband and children loved it. Thank you soo much nisha. Keep up the good work nisha. The fried rice tasted great. Thaks a lot.. I like this very much. Can prepare easily when guests are there. One thing to note -- pls rename this as KERALA SPECIAL FRIED RICE. Okay. Ur recipe is simply superb.. I tried it. Excellent ...!!!! Thanks a lot for the recipe. My family liked it a lot. Except the cardamom and cloves, the recipe is good. Thank you very much, my husband loved it. It is a nice recipe. My husband like it very much.My little daughter also enjoyed it. Its exellent and very tasty. I liked the yummy dish very much. Thanks.I have easy time when guest come home now becos of ur recipe.WE-my husband,myself and our friends like it a lot.I prepare this once in two weeks mostly with chilli chicken.Good and continue giving more recipes. Awesome recipe! Thnx..Btw I think it tastes best with the spices in it. The recipe is excellent. It`s very very similar to what my grandma called `Jungli pulau.` She`d occassionally add pieces of meat or chicken to it too. To clear up the fried rice/pulau debate: What some folk call pulau others call fried rice. I discovered this while in Australia, Canada, Pakistan & India. And yes, Chinese style fried rice does not contain cinnamon, cloves or cardamom. But then, who really cares what a dish is labelled as long as it tastes great, like this one certainly is. Nisha ur recipe is simply suberb. U are really an EXCELLENT cook. Yummy ................i just tried....it is so tasty. It is a delicious recipe. It came out well by adding cardamoms because it is very less. Should we drain rice before mixing it & stirring?